SurveilStar Agent Tools includes Confirm-Code Generator and Agent Offline Utility. When the agent computers fail to connect to the server, for example, disable the network card or a business trip, but temporary need to clear policies or uninstall the agent, by now is unable to establish the corresponding strategy through console. Users can directly make use of agent tools to temporary clear all policies, unlock agent, clear security password and uninstall agent through Agent Tools. As to the detailed steps, please refer to the chapter: Uninstall SurveilStar. 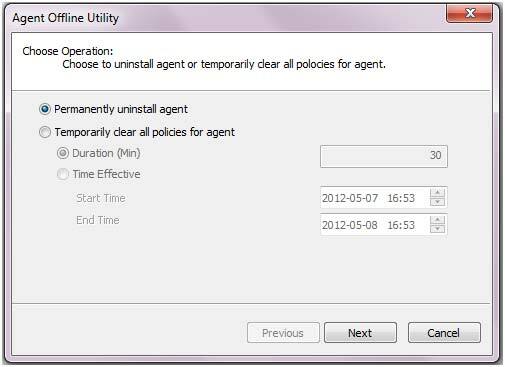 When the agent computer is offline and permanently need to uninstall agent or clear all policies for agent, clinking menu Tools > Agent Tools > Agent Offline Utility.